Eric Clapton, Mike Bloomfield, Jimi Hendrix, and Stevie Ray Vaughan have been among his greatest admirers, each integrating elements of King’s original style into his own playing. In Strange Brew from Cream’s 1967 album, Disraeli Gears, Clapton payed homage to King by using the solo from his song Oh, Pretty Woman. Jimi Hendrix said that King’s Crosscut Saw was one of his favorite tunes. And Stevie Ray Vaughan was a great fan, recording an In Session television special with his hero in 1983. 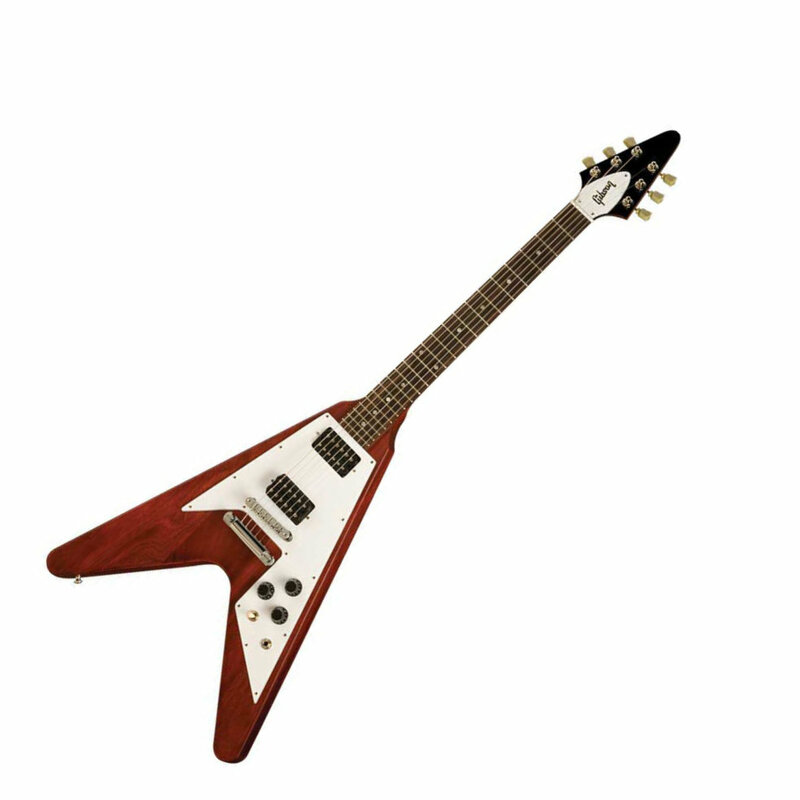 A huge man with a reputation for a fearsome temper and for carrying a .45 pistol, King was one of the first guitarists to play a Gibson Flying V, whose symmetrically shaped body probably was advantageous for his upside-down, left-handed guitar style. He played his guitar in alternative tunings (often E minor) and was able to pull off prodigious note bends in what became a unique, vocal style of playing. What’s more, he didn’t use a pick, mainly using his thumb to pluck the notes. 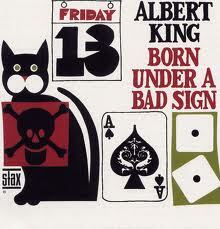 King’s major break-through came with the release of his 1967 album Born Under a Bad Sign by Stax records in Memphis. 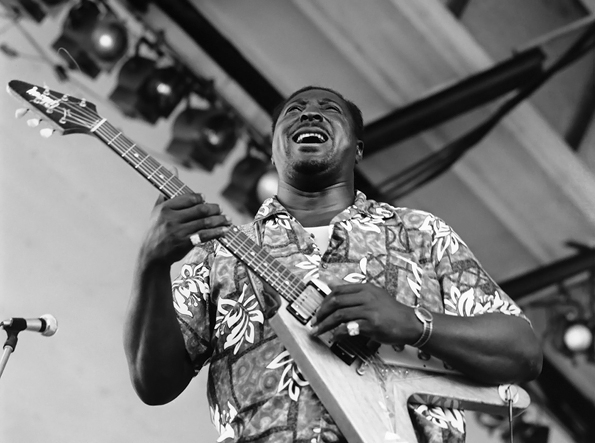 The album, which was well produced and managed to achieve a traditional blues sound which was at the same time fresh and contemporary, propelled Albert King to mainstream popularity at the comparatively late age of 44. The title track has been covered by a host of artists, including Cream, Peter Green, Paul Butterfield, Jimi Hendrix and Robben Ford. If it wasn’t for bad luck, I wouldn’t have no luck at all. Like many of the other bluesmen of this era, Albert himself had surely known hard times. One of 13 children, King was born in 1923 and grew up picking cotton on plantations, and then worked as a bulldozer driver (hence his nickname, the Velvet Bulldozer), while he scratched a living, playing small southern clubs and dives. 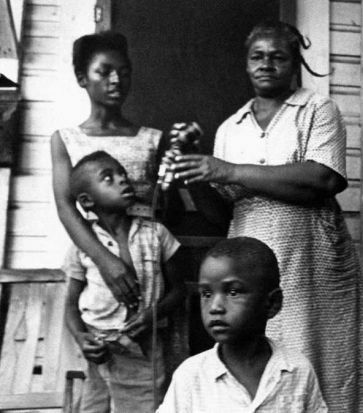 “I been down since I begin to crawl” was a line many blacks from this period could have identified with – all the indices for black communities, particularly in the South, were poor, in terms of education, child mortality, life expectancy, healthcare provision and labor opportunities. Life was hard, and the blues surely gives expression to this. The songwriters attribute this to being “born under a bad sign” and “bad luck.” Actually, of course, the real reasons for the difficulties experienced by black communities was structural white oppression. But it’s not unusual for people to attribute their poor circumstances to bad luck – as far back as the world of the Mediterranean Roman Empire in the first century AD, people in the large urban centres lived lives of poverty and hardship, and up to a third of them were slaves. Superstition was rife and belief in the “evil eye” and the power of Fate widespread. In a pre-scientific world, people needed something to blame their troubles on and to feel they had some means of avoiding it – hence the widespread pagan practices of sacrificing to the gods. And the deep suspicion with which a new group which had sprung up was viewed – Jesus followers who refused to acknowledge the gods and who, many thought, were thus endangering their communities. The early Jesus followers believed that there was no power on earth equal to the power of their God and that they were no longer subject to the whims of the gods or to Fate. St. Paul told the Corinthian Christians that, of course, there were many “so-called gods…but for us there is one God…and one Lord, Jesus the Messiah.” This enabled these people to live without fear and to believe that they could forge a new kind of life for themselves, new communities of freedom, joy and justice, as opposed to living with a sense of dread about what might happen next. Such freedom allowed them to love and support each other freely and model a quality of life that truly was an alternative to the oppressive structures of the Roman Empire and a pagan outlook on life. For them, they’d found a gracious God who was at work amongst them who was “working all things together” for their good. Sometimes life does just seem “like one big fight,” and the going gets tough. Question is, how do you react to that? Blame it on bad luck, get depressed that things are not going our way? 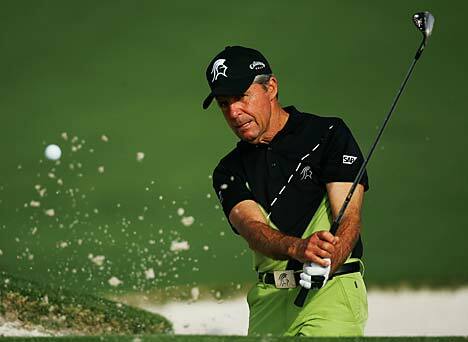 South African golfer Gary Player once famously said, “the harder I practice, the luckier I get,” meaning that our fortunes are in our own hands, in the way that we react, the determination with which we take life. There’s a lot of truth in that for sure, but that only takes us so far. There’s something beyond luck, fate or even our own ability to determine our own futures – and that’s the positive, defiant faith in a gracious God that the first Christians discovered, that enabled them to have courage and to start looking for a better day. For everyone who’s been “down since they started to crawl,” there is hope, there are new possibilities – St. Paul again, talking to people who were facing hardship, trouble, famine and danger: “in all these things we are more than conquerors through him who loved us” (Romans 8.37).